FREE Craftsy classes -One Day Only! I wanted to let you know that for one day only you can watch all 1,200+ Craftsy classes for free! On Labour Day, September 4, 2017, all of Craftsy's classes are available for you to view absolutely free. This is a perfect opportunity to check out those classes that you've had your eye on and to learn some new skills. If you don't already have a Craftsy account, sign up now with your email address and then enjoy as many classes as you can watch for one day only. Setting up a Craftsy account is free, so I'd sign up now so you can browse the classes and choose the ones you want to watch on Monday. Enjoy your long week-end and happy viewing! P.S. I am a Craftsy affiliate and as such I will receive a small amount of compensation if you purchase items by clicking through the links in this blogpost. Thank you for allowing me to continue providing free content for you. It's finally here: the Black Friday and Cyber Monday sale at Craftsy! I am a Craftsy affiliate and as such receive a small amount of compensation if you purchase through the links on my website. Thank you for your support. Celebrate with a Craftsy Sale! It's Victoria Day this week-end in Canada and Craftsy is continuing their birthday celebration with 50% off member-favourite classes. Grab a class before the deal expires on Saturday, May 21! 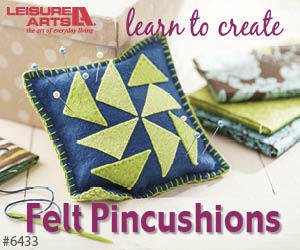 Here are some of my favourite Craftsy classes - and they're on sale for the next few days. Celebrate with Craftsy and enjoy savings on that class you've always wanted to try. Hurry, this offer ends on Saturday. P.S. I am a Craftsy affiliate and as such will receive a small compensation if you enroll by clicking through any of the links in this post. This helps me to continue to create videos and blogposts just for you. Thank you! Just a quick post to let you know about the sale on craft supplies this week-end at Craftsy. While their clearance prices are fantastic, this week-end they're even better! Craftsy is taking an additional 20% off their existing clearance prices to give you great deals on their project kits and supplies for only a few days. Be sure to check out the deep discounts on your favorite brands before their Winter Clearance sale is over! Now's the time to pick up those kits and supplies that you've had your eye on. Hurry, this sale only lasts until 11:59 p.m. MST on February 29, 2016. P.S. I'm a Craftsy affiliate and will receive a small amount of compensation if you purchase items through the links in this blogpost. Thank you. Are you still frantically quilting away on Christmas or holiday gifts? If not, good for you! For those who are - there is still over a week until Christmas so you're right on track. This is when I'm usually starting to decide what type of quilt motifs to put on my gifts. I waffle between small designs, such as pebbles, that take me forever to finish. I did this last year on a table runner for my brother. Loved the results, but man, did it take a long time to finish! This year I've been working on free motion feathers after watch Patsy Thompson's Craftsy class, Ultimate Free-Motion Quilting. Patsy creates stunning designs and with her practical, step-by-step approach, it's easy to learn how to create wonderful feather designs. Remember last week when I talked about being afraid to try something new. Well, feather quilting was always on that list for me. Now that I've taken Patsy's class, feathers don't seem nearly as daunting! Here are some photos of my first attempts. 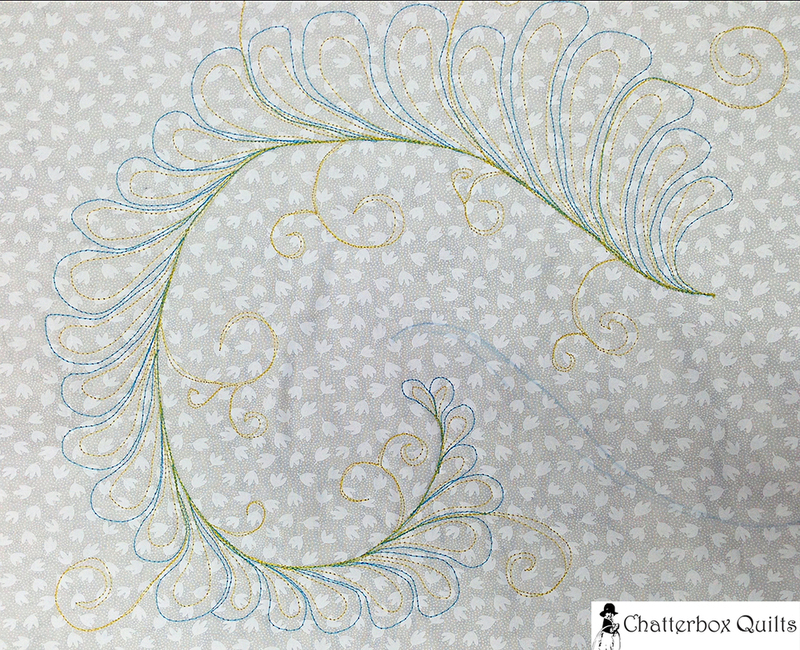 This is what Patsy calls hyperquilting, where you start in one colour and then go over with a second thread in a contrasting colour. By using two different colours I could really see my work - and where I need to improve. The best part of doing this was that I really enjoyed quilting feathers! Now I've got another quilt motif to add to my repertoire. If you've been afraid to try free motion feathers, but would like to, I highly recommend Ultimate Free-Motion Quilting by Patsy Thompson.